We won't be hanging flower baskets on neighbors' doors today -- still snow on the ground, and it's cold and windy this morning. And now, on with the parade! Jennifer is a recent UFO Challenger, and she is really cranking out the finishes. I love her little table topper. 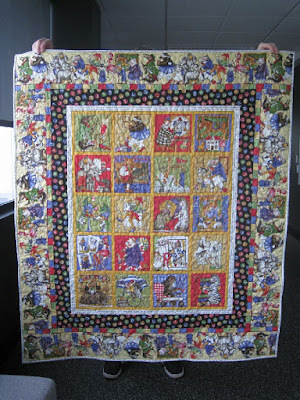 Jennifer let her 7 year old daughter play with the decorative stitches on her machine to quilt it. So fun, and what a great way to share the love of sewing! 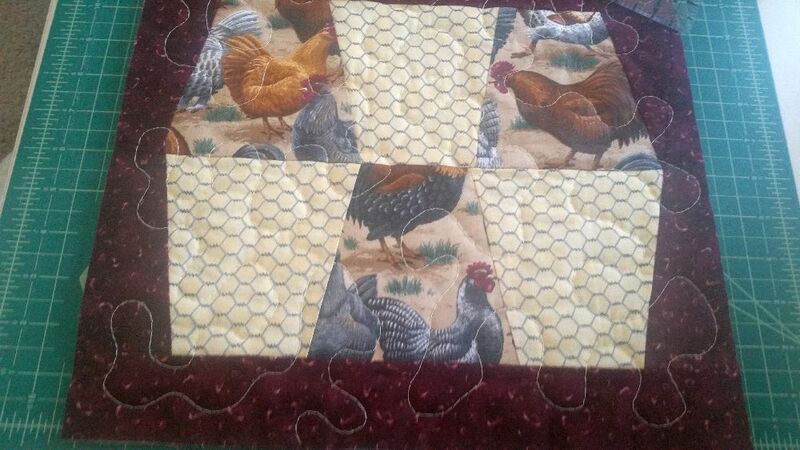 Jenn's second finish for April was a set of placemats for a co-worker (they're both teachers) who raises chickens. They'll be bound in grey and gifted to her friend when Jenn returns to work after compassionate leave. One of my favorite customers at Ruth's Stitchery, Ethel, really puts me to shame with her productivity. But I love seeing what she makes with fabrics from our shop! This quilt uses Amy Ellis's new line, Serenity. Isn't it just lovely? So peaceful, and well -- serene! 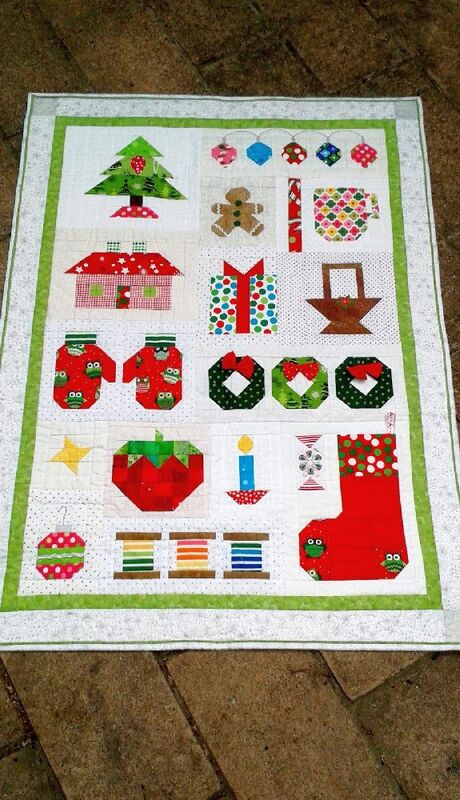 A long-time blog follower and UFO challenger from Australia, Susan, sent in this photo of her Lori Holt Christmas quilt. Lori shared the QAL on Instagram back in 2014. Susan substituted the strawberry block from Lori's Farm Girl Vintage for the log cabin block -- she says it's "more appropriate for an Australian Christmas." 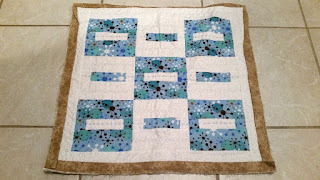 A group is doing Farm Girl Vintage as a block party at Ruth's Stitchery -- I can't wait to show them your quilt, Susan! Kerry finished piecing her Bonnie Hunter mystery from last autumn. 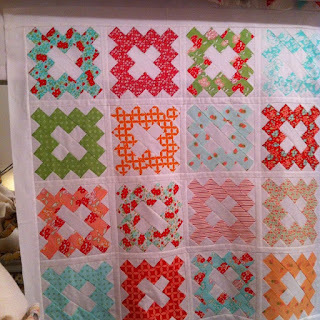 Allietare will have scalloped borders once it's quilted -- can't wait to see that! This is a large quilt -- 86" X 91" -- and Kerry reports it uses 25 yards of fabric! Way to make a dent in the scrap stash, Kerry! All the details are at Kerry's Quilting, here. Nancy finished Frivol #1, "Hello Darling." It is darling, and those cute tins of fabric and treats are darling, too! Nancy's second April finish served as an educational tool. The recipient of this cute baby quilt didn't really know about quilts -- she will now! 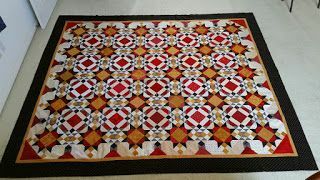 Another California girl has finished another Bonnie Hunter quilt. I love them, and I love that all Sandi's quilts' names begin with "K!" Kissin' Korner is a Bonnie Hunter design called Kiss in the Corner! 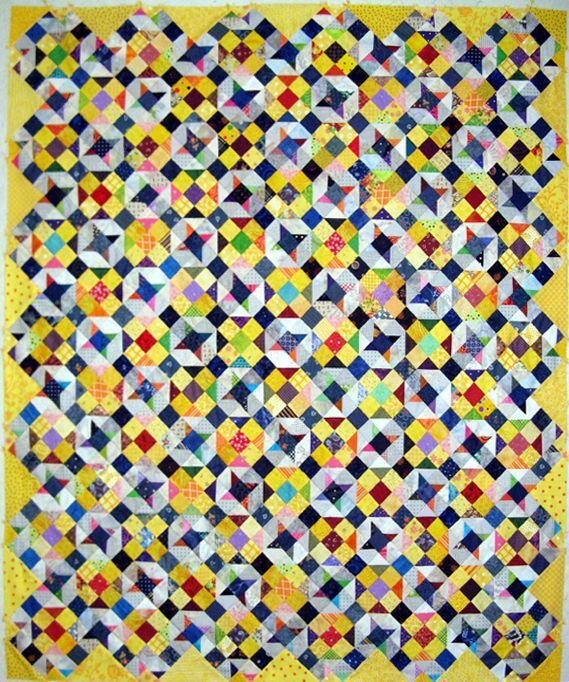 She's awesome to bring us all the FREE patterns on her Quiltville website. Here is a link to it should you want to make one too. I really enjoy the smaller pieces. This design used 2" and 1" finished squares. I had everything in my stash to complete it including the back and a batting that will end up as one, but started out as four pieces. I'm all about stretching out my stash, which also includes the batting =^.^= You can read more about my project for April on my blog KwiltnKats.. Be sure to go to the labels box on the right and select Kissin' Korner for all about the project since I started it. You'll even learn about my oops! Sandi, that is really something! I had to biggie-size the photo so everyone could see the details of this beauty. and keep those cards (emails) and letters (photos) coming! 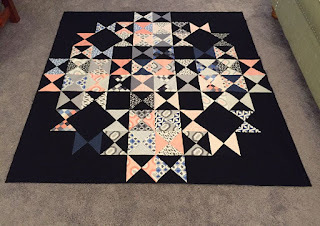 Thank you for all of the quilty eye candy and inspiration! Another lovely roll -up - all great projects - Love Kissing Korner...no way would I be able to find that many/much yellow in my stash...but I could probably muster up enough of the other colours. Love the Allietare too - and scalloped borders will be gorgeous. Great work everyone. Well, I didn't get my Fiesta quilt done, haven't been in the mood to sew at all, but these other finishes are just great!! I'm so proud to be included with this great group! No time for Ufo's for me this month. We went away for a couple of weeks and between that and keeping up with The Splendid Sampler blocks I didn't get much else done! Lots of lovely quilts from everyone else to look at though. Love Ethel's quilt. Well done everyone!